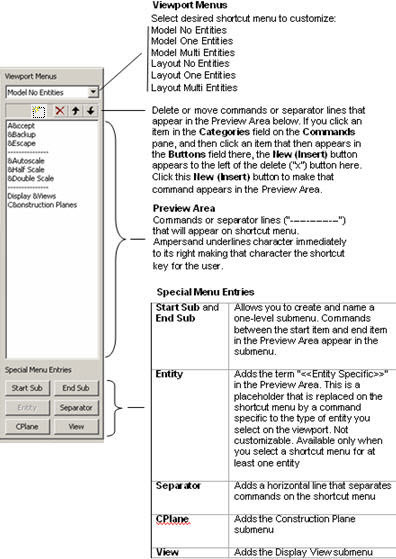 Choose which menu you wish to modify and note the text below which lists the options contained within the right click context menu. To modify existing options left click highlight and choose among the available icon options. To add options choose the New Insert after left clicking on an icon from the Categories Tree. NOTE: The menu will not appear if you are inside of a message loop when a mouse button has been assigned for the button/modifier combination. If not in a message loop, the menu will appear regardless of any modifiers in use. You can use this section of the Commands pane to customize any of these only when you select the Enable right mouse button viewport menus (overrides function assignments) check box. This check box is on the Viewport pane of the Customize dialog (Tools>Customize>Viewport).